This review of DG Health Athlete’s Foot Cream is to help the customers who are searching for creams for athlete’s foot to make a wise and informed decision. The cream aims to treat athlete’s foot and reduces the itching and burning. The product is available on its website as well as on other shopping websites. Read on to find out more about the cream as well as to how effective it is in treating infections. The list of ingredients is not given on the product’s website and is only mentioned on the cover of the cream. The active ingredient is %1 Tolnaftate which is found in the cream and is used mainly to treat athlete’s foot. There are no available directions regarding how to use the cream on the product’s website, but they are provided on the cream’s container. It states that you are supposed to keep the infected area clean and dry and then apply a thin layer of the cream to said skin. One should apply the cream twice a day, once in the morning and once at night. For athlete’s foot, pay special attention to the skin in between the toes, wear well-fitting, airy shoes and change your socks at least once a day. For athlete’s foot and ringworm use daily for 4 weeks, for jock itch use daily for 2 weeks. If the condition persists longer, consult a doctor. Although nothing has been mentioned on the product’s website it is written on the cover of the cream that it is for external use only. When using this product avoid contact with the eyes. Stop use and consult with a doctor if irritation occurs and there is no improvement within 4 weeks. Do not use on children under 2 years of age. Keep out of the reach of children. If swallowed, get medical help or contact a Poison Control Center right away. On the website, the price is $2.95 and there is a monthly delivery option. There is a money back guarantee provided on the website and it states that one should enclose the bottom perforated portion of the original packing slip with the item. One can expect a refund in the same form of payment originally used for the purchase, within 30 days of receiving the returned order by the company. There are no reviews on any website regarding this cream and it is advisable to consult a doctor before using this cream. 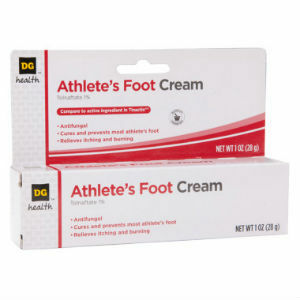 DG Health Athlete’s Foot Cream provides a money back guarantee. That being said, the product does not give information about how it works, how it is supposed to be used and there is no mention of the ingredients that are present in the cream. Until one buys the product, they are at a loss regarding this information. Jimmy Rodriguez	reviewed DG Health Athlete's Foot Cream	on November 19th	 and gave it a rating of 3.